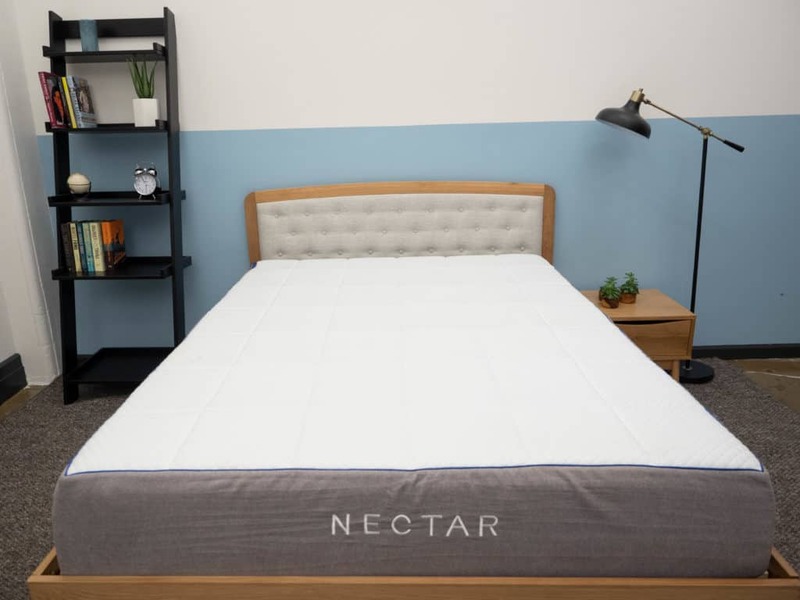 Nectar vs Purple Mattress Review - We Compare To Help You Decide! For this comparison, I’ll be pitting two superstars in the bed-in-a-box universe against one another. 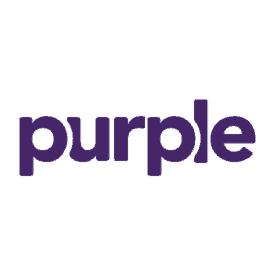 In one corner, we find the Purple, a popular brand best known for its hyper-elastic polymer super grid. 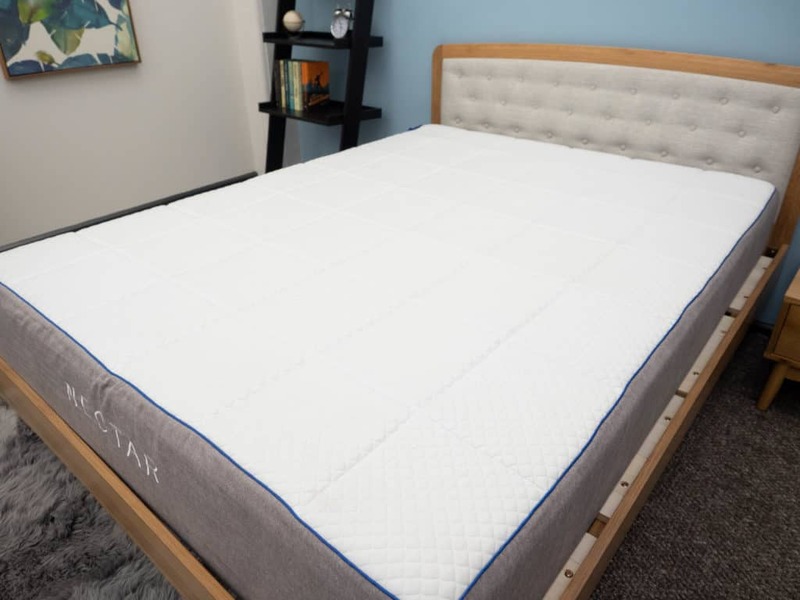 And in the other, industry giant Nectar, a deceptively straightforward bed that packs a formidable punch in the form of its thick memory foam top layers. It’s hard to say who will reign supreme once these two adversaries meet. Where one is weak, the other’s strong, and so their different feels could be impossible to compare. But I’ve never let that stop me before! 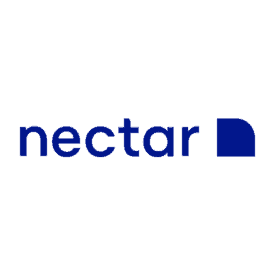 To stand courtside to this Purple vs. Nectar battle royale, continue reading on below or click here to skip to the comparison summary. Before we get into all the stuff that makes these beds so different, let’s take a minute to talk about their similarities. Though it’s true that both brands offer wildly unique takes on the bed-in-a-box trend, they do share some surprising characteristics. 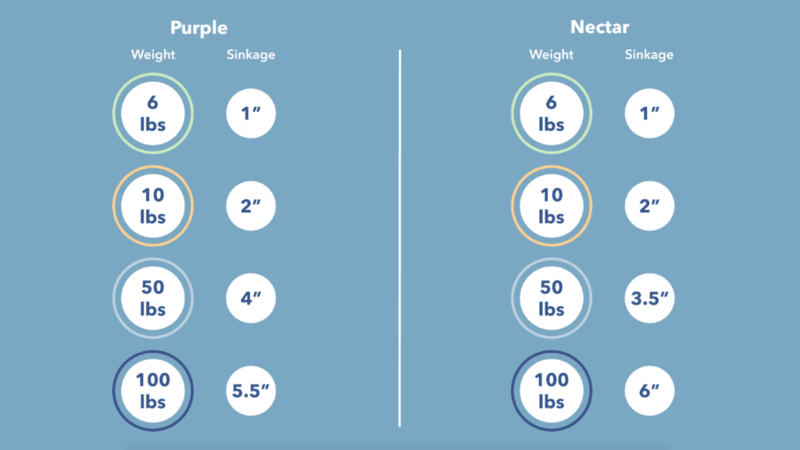 Popularity – As you’ll see in greater detail below, the Nectar and Purple aren’t very similar at all. However, they’ve both managed to become two of the most popular beds on the market. And how? By going for specific feels using some of the best materials available. Cooling – Though they do it in different ways, both beds are designed with cooling in mind. We see this in Purple’s “temperature neutral,” breathable smart grid and in the Nectar’s gel-infused memory foam top layers. 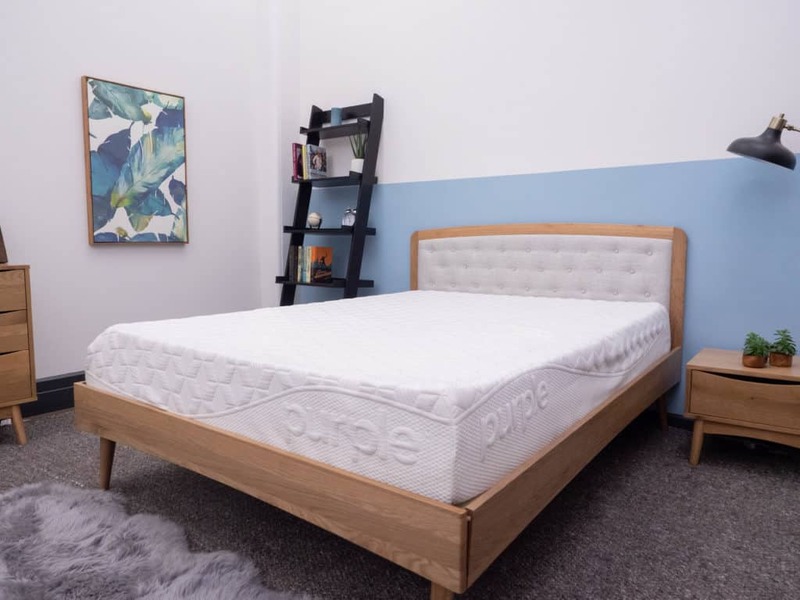 All Foam… sort of – So while the Purple does technically utilize a polymer material in its comfort layer, I think it’s worth noting that both of these beds are built entirely sans pocketed coils, which gives them a different feel than a hybrid or more traditional innerspring. Keep in mind that this is just for the Original Purple as the brand does have a few hybrid models, which I’ve previously reviewed. Now that we’ve got the similarities out of the way, let’s see how our clandestine heroes fare once the magnifying glass is turned on their respective constructions. I’m going to walk you through a brief synopsis of each bed’s specific build below, but would encourage you to also check out our full reviews of the Nectar and Purple. Cover – The cover of the Nectar is built with both cotton and Tencel, an eco-friendly material known for its softness and breathability. There’s also an inch of gel memory foam quilted into the cover, providing the sleeper with some immediate comfort. The gel infusion combined with the cooling Tencel fibers helps to regulate temperatures throughout the night. Comfort Layer – Next up, you’ll find 3” of memory foam. This material has a slow response to pressure, allowing the sleeper to really sink in for some satisfying pressure relief. As the foam contours to the body, you’re likely to feel as though you’re sleeping more “in” the bed than “on top” of it. Transition Layer – Directly below the comfort layer, you’ll encounter a transitional layer of memory foam, which has a slightly quicker response to pressure than the foams above it. This section is meant to ease the sleeper into the firmer base below, helping to extend the contouring of the comfort layer even deeper into the mattress. Foundation Layer – Rounding out the construction we’ve got 6” of high-density poly foam. This section gives the bed its stability and shape, providing a firm foundation to support the softer foams above. Cover – The cover is composed of a polyester and spandex blend, making for a material that’s thick, stretchy, and breathable. Comfort Layer – The comfort layer of the Purple is made up of the brand’s Smart Comfort Grid™, comprised of a hyperelastic polymer that adapts to you in real time. What this means is that as you move around, you’ll find that the polymer moves with you, conforming to your body no matter the position. This results in a contouring feeling absent of the kind of sinkage you’d get with a memory foam layer like the one we see in the Nectar. This grid is also technically temperature neutral material and works to actively dissipate body heat throughout the structure. Foundation Layer – The base is made up of another four inches of high-density poly foam, imbuing the structure with its stability and shape. The thick layers of poly foam here make for a firm bed that’s likely to keep the sleeper positioned more on top of the mattress than in it. Comfort – The differing comfort layers establish the divergent feels these beds are going for. The Nectar aims for a gentle, pressure-relieving structure, which is embodied in its thick layers of memory foam up top. Conversely, the Purple wants to keep the sleeper positioned on top of the bed, so utilizes an extremely bouncy hyper-elastic polymer comfort grid. Support – These feels are accentuated by the support layers employed by these two mattresses. In the Nectar, we see a simple base of poly foam, which functions mainly to support the sleeper as they sink through the gentle top layers. 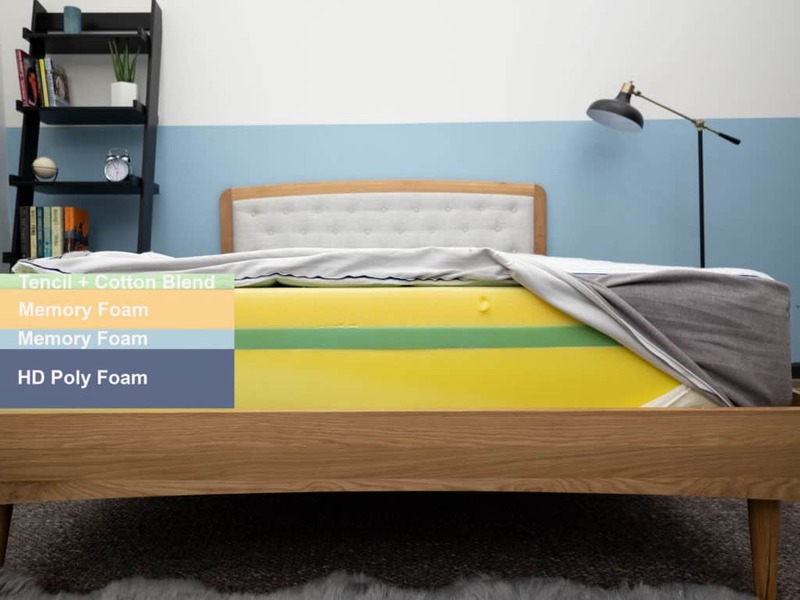 In the Purple, the vibrancy of the smart grid is further highlighted by eight inches of firm high-density poly foam, which lift the sleeper up and out of the bed. 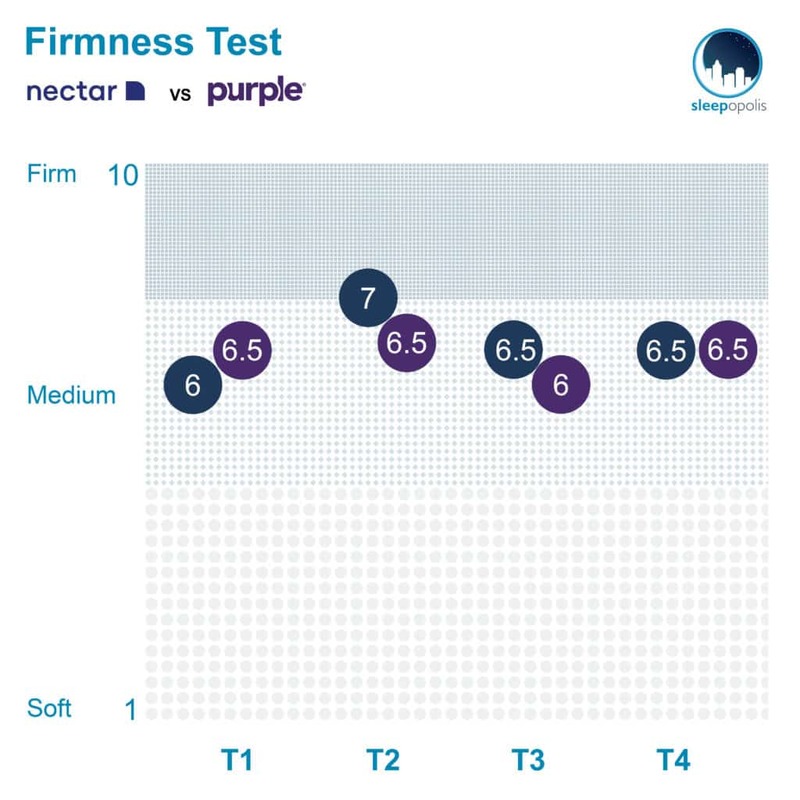 Though there was a bit of variance among my testers, we ended up giving the Nectar and average firmness rating of 6.5, which syncs up perfectly with the industry standard for medium firmness. I personally gave the Nectar a 6 as I found its thick memory foam layers produced a gentle, pressure-relieving vibe. No matter the position I stretched out in, I felt the material contouring to the curves of my body for some pretty intense sinkage. 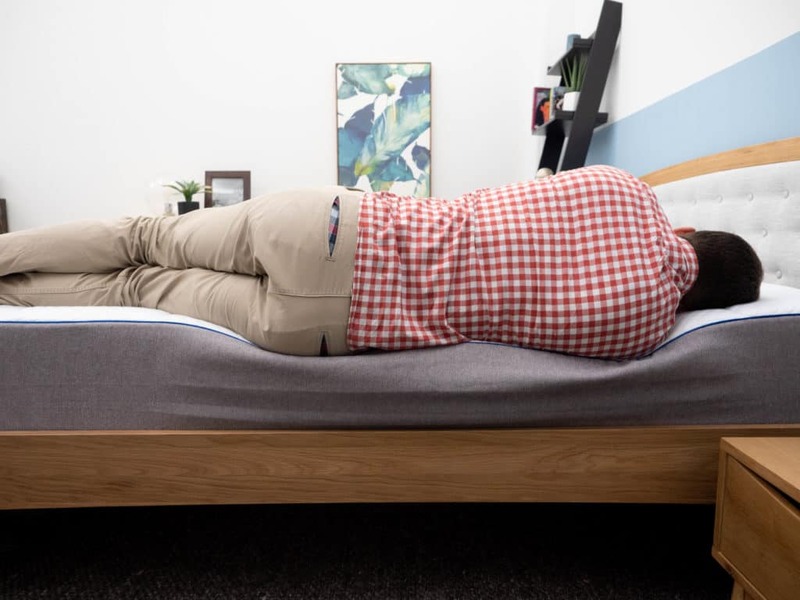 While this resulted in a softer rating for me, some sleepers may find that the memory foam produces a firmer feel as their bodies acclimate to its morphing shape. 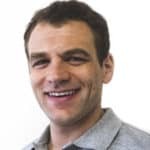 This feel is going to work especially well for side sleepers, who will likely find a lot to love in the cushiony pressure relief they’ll experience at the shoulders and hips. Back and combo sleepers, on the other hand, may find this lack of support to be a tad detrimental to their overall comfort. As far as edge support is concerned, the Nectar features pretty solid support across the entire surface area of the bed. Good news for all dreamers, but particularly so for couples who need to maximize their usable space. Interestingly enough, my testers actually ended up responding similarly to the Purple as they did to the Nectar, giving it an average rating of 6.4, marking it as a medium firm bed. The Purple got a 6.5 from me as I found it had a pleasant mix of both pressure relief and support. While you’ll definitely experience a sort of quasi-sinkage through the hyper-elastic polymer comfort grid, the bounce of the material is bound to lift you up and out of the structure. This should satisfy a wide range of sleepers, but could be especially good for those of you who doze in multiple positions throughout the night. As far as edge support’s concerned, I found the Purple to be incredibly stable at the side of the bed, which tells me that it could be a great pick for couples. These are very interesting results, because they show that you’ll actually experience similar amounts of sinkage with both the Nectar and the Purple. 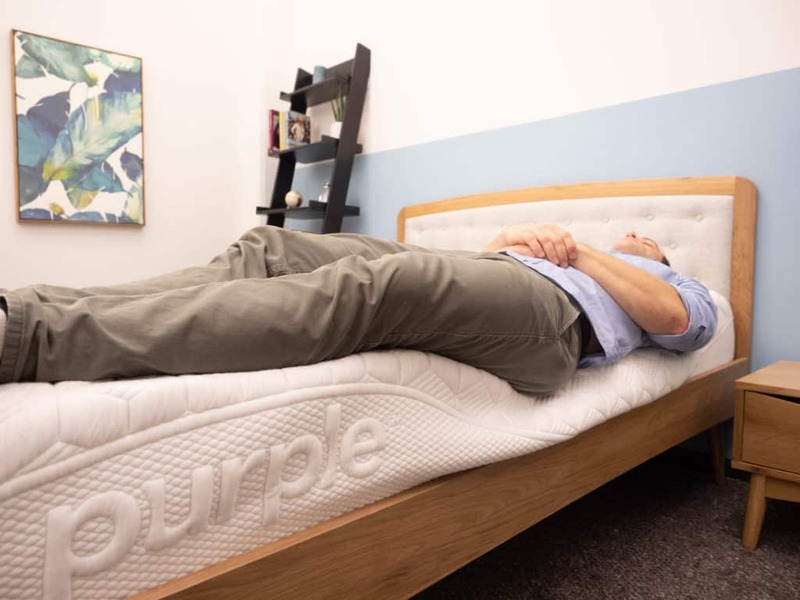 However, because the Purple is so bouncy, you’re more likely to feel as though you’re sleeping “on top” of it, while the thick memory foam layers of the Nectar will leave you feeling more “in” the mattress. Here, the Nectar’s memory foam shines as it works to dampen and absorb disturbance across the structure. The buoyant lift of the Purple may make it easier to get up and out of bed, but it’ll also lead to higher rates of motion transfer overall. From the jump, I knew this comparison was going to be a challenging one because the Nectar and Purple don’t appear to share very many similarities at all. And while it’s true that I wasn’t fully able to connect the dots and say with any certainty that one of these beds is superior to the other, I think that’s actually the point. For me, the Purple and Nectar are foils of one another, attracting the kinds of slumberers the other can’t wholly satisfy. Where the Purple is extremely bouncy and supportive, the Nectar is soft and gentle. 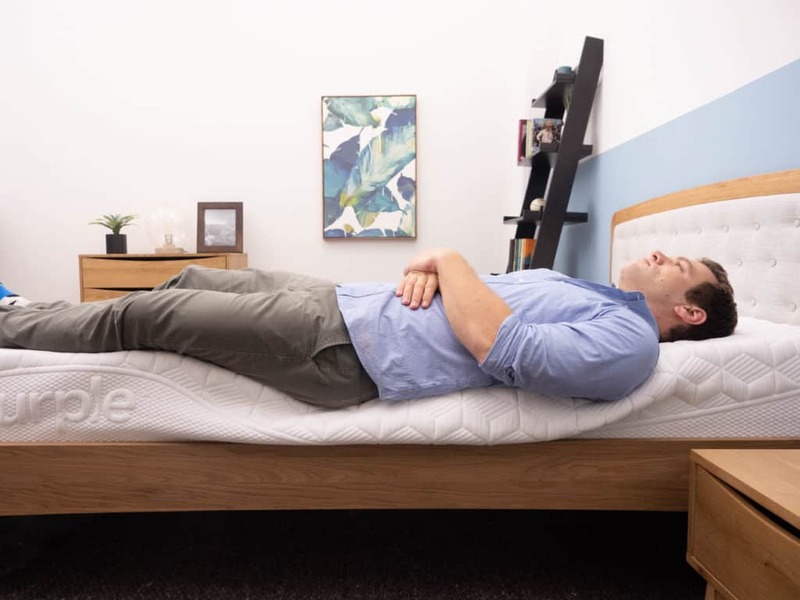 Combo sleepers will naturally be drawn to the former while side sleepers will likely flock to the pressure-relieving memory foam of the latter. The first thing to figure out is what kind of feel you’re after. If you want to feel like you’re sleeping on top of your bed, I’d say go with the Purple. However, if you prefer sinking into your mattress, you’ll be more satisfied with the Nectar. The second comes down to bounce. If you absolutely need a structure with some buoyant support, you’d be best served by the Purple. However, if you’d rather not have any bounce, then the Nectar could be great for you. And finally, let’s talk about price. Between the two, the Nectar is the less expensive option, which could be a big selling point for those of you looking for a value buy. 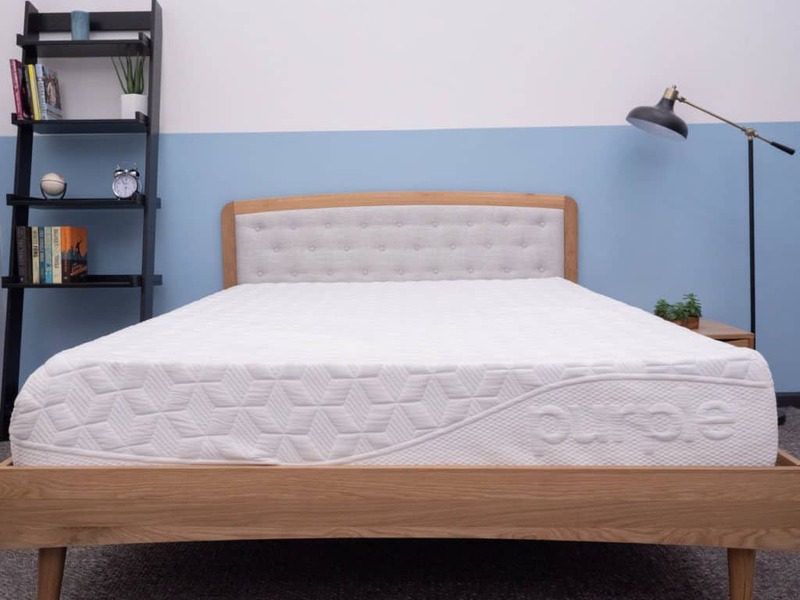 As we’ve seen throughout this review, the Nectar stands out for its thick layers of memory foam, which could provide folks with some deep pressure relief. The ones who might benefit from this most? Side sleepers, who will likely experience some fantastic cushiony contouring at their shoulders and hips. With the Purple, it’s all about the combo sleeper, as the bounce from the comfort grid makes it incredibly easy to move around and change positions. I’d also say another win for the Purple comes in its ability to sleep cool, which could be an attractive feature for those who sleep hot. Well that does it for this Nectar vs. Purple comparison! If you have any more questions or comments, please feel free to leave a message on the video.